If you're new to QuickBooks Online, then all of the accounting terms can be quite confusing. We'll explain what you need to know to get started. If you'd like, you can read more about Chart of Accounts and Products and Services through the buttons below. Watch the video below to see how to create an account, a service item, and how to link the two to use for the Line Item page on SellerZen. We use QuickBooks Online Service items to map Amazon sales order line items like Commission and Gift Wrap income. Your chart of accounts contain all the accounts for your business: income, expense, liability, and bank. Basically, any money that is paid to you will go into an income account, while any money that you pay will go into an expense account. To be able to track your income and expenses accurately, we recommend that you create accounts and name them accordingly. 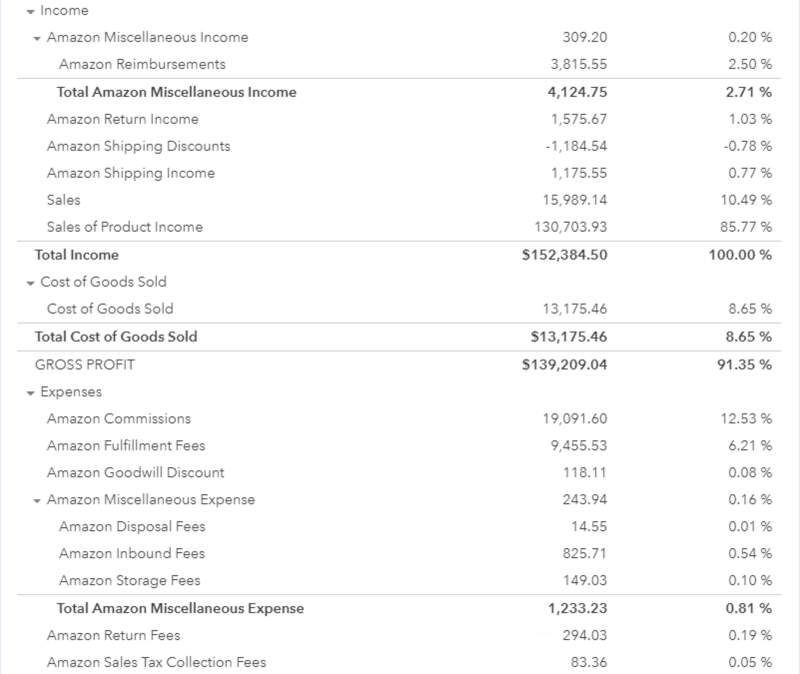 Take a look at this sample invoice from Amazon on the SellerZen platform. 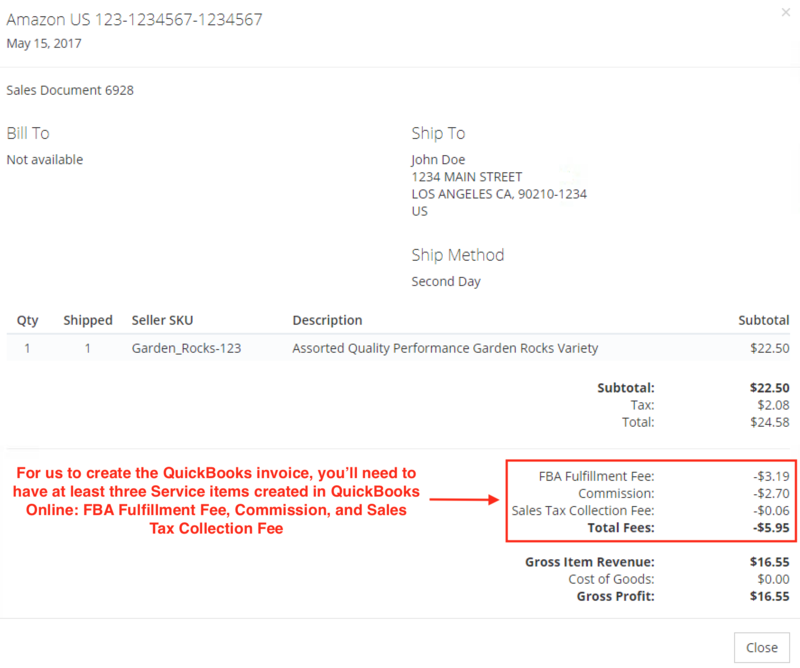 You need to have a QuickBooks Service item for every type of line item on your Amazon sales order. Go to Sales > Products and Services to begin creating your Service items. 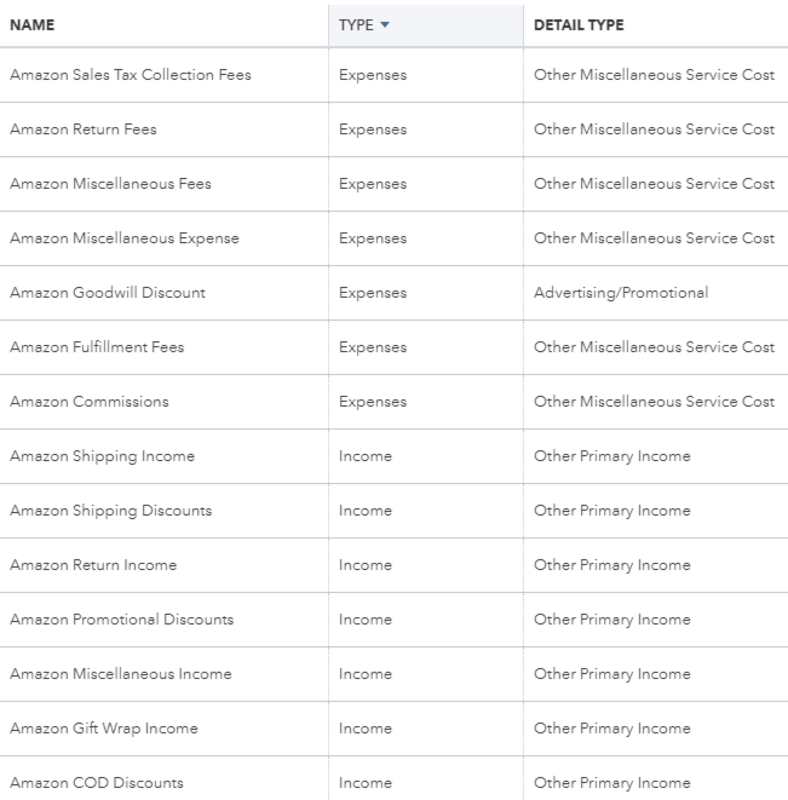 Give the Service a name that matches or aligns with the Amazon invoice line item. This is important because the reporting will be unclear if you give the Service a generic name like "Amazon Fee." Then choose an account from your chart of accounts for the Service for the Income account field. Even though the field is titled "Income account," you can choose any type of account (income, expense, liability) from your chart of accounts. If you haven't created the account in your Chart of Accounts, you should do this now. Read below for more information. 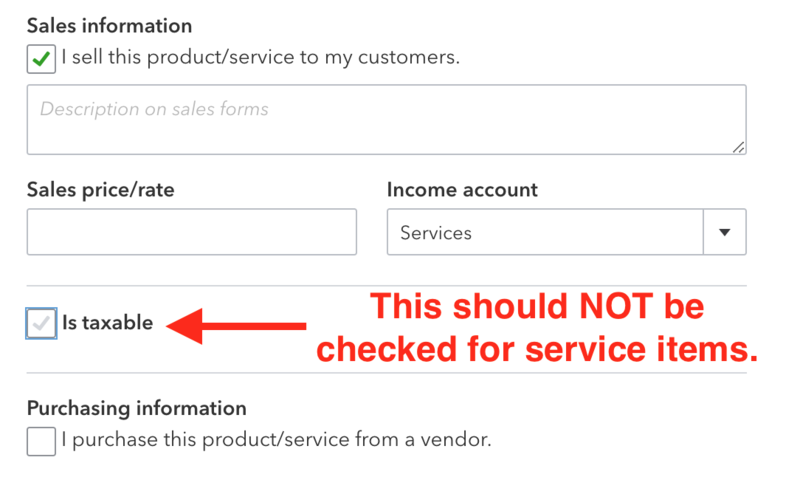 Make sure the "Is taxable" box is unchecked for service items. 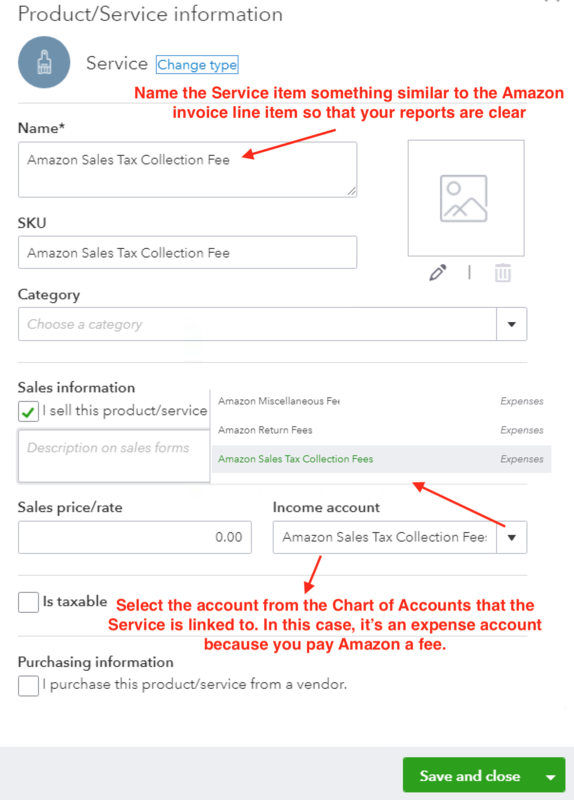 If you try to map an income line item like Shipping Revenue to an expense account like Sales Tax Collection Fee, you'll get an error that says "Income account type must be of type Income." To fix this error, simply choose the correct Income account in your chart of accounts. If these accounts don't exist in your Chart of Accounts, you'll need to create them before you can link the Service items. Below is an example the accounts our Setup Wizard creates in the Chart of Accounts. Why is all of this necessary? Proper service mapping and properly configured Chart of Accounts can give you a very detailed look into your business. Take a look at a Profit and Loss report below with custom account mapping. You can individually map non-order transactions on the "Settlement" tab. You have complete control over how detailed you want the reporting to be. Some sellers lump all of their non-order fees like inbound fees and storage fees into "Other Expenses," while other sellers want a more detailed breakdown of their costs. If you need help setting any of this up, click on the Intercom chat icon on the bottom right of the screen and we'll be happy to help.